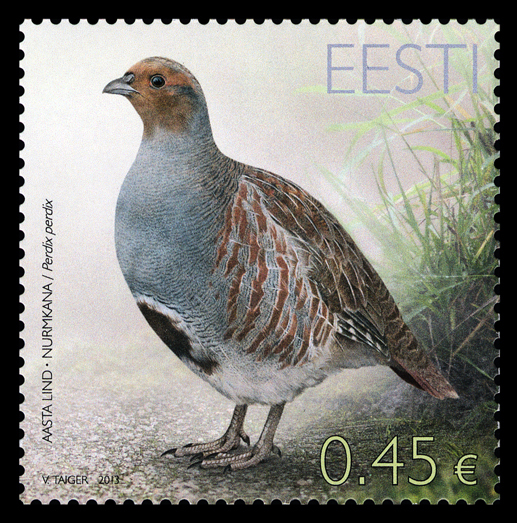 The Grey Partridge (Perdix perdix) is a small bird of the pheasant family who mainly lives in farmland – in fields as well in pasturelands. It passes the winter in groups, often in the vicinity of human settlements. The winter groups split up in April when coupling takes place. In the nesting period, in May to June, they lead a very covert way of life. The nest usually has from 15 to 20 eggs, and the young fledge at ten days old. It is a species of dwindling numbers that are most affected by predation and by the use of pesticides in farming. There are presumably about 4,000 to 8,000 couples of the grey partridge in Estonia at present.